We’d love your help. 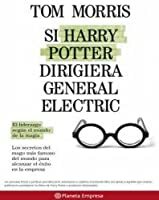 Let us know what’s wrong with this preview of If Harry Potter Ran General Electric by Tom Morris. Business author Tom Morris reveals how the leadership secrets, wisdom and insights of Harry Potter's world of wizards applies to the world of business. To ask other readers questions about If Harry Potter Ran General Electric, please sign up. I picked up this book because the title was quirky. I'd never heard of Tom Morris or even seen any of his other books. The thesis of this book is that there are lessons one might learn from JKR's world which concern leadership. These lessons might be important, relatable and singularly beneficial to enhancing oneself morally and spiritually. To be honest, this book doesn't really deliver on what it promises. It reads like a thought leader putting Harry Potter into a bog-standard speech about mora I picked up this book because the title was quirky. I'd never heard of Tom Morris or even seen any of his other books. The thesis of this book is that there are lessons one might learn from JKR's world which concern leadership. These lessons might be important, relatable and singularly beneficial to enhancing oneself morally and spiritually. To be honest, this book doesn't really deliver on what it promises. It reads like a thought leader putting Harry Potter into a bog-standard speech about morality and how being truthful and ethical is the key to a good life. The models used are Harry himself and Dumbledore. While I agree with the book to quite some extent, I did not feel I learned anything new from it. It was a staid diversion from the normal stuff I read. The author might have been better advised to go through the philosophies from which he draws. A linking of the Stoics and Dumbledore, who seems very much their number, is great, but does me no good if I merely know that the link exists. A development of the hows, whys and wherefores of the Stoics themselves and how that philosophy ties into what Dumbledore does and thinks would be a much better use of ink and pages as well as my time. The rest of it doesn't really borrow much from philosophy as such. The author doesn't seem to have done his research on Eastern philosophy, Dharmic literature, Chinese philosophy or even European Philosophy and merely pulls rabbits out of a hat containing the sayings of Seneca and Aurelius. The writing is easy to follow, but not very fulfilling when one does do so. This report was written for BCIT's Peak Leadership program. tl;dr : A few good points; a few things I seriously disagree with; despite the Harry Potter, I was bored. The central idea of If Harry Potter Ran General Electric: Leadership Wisdom from the World of the Wizards can be summed up as: To be a great leader, you must be an ethical person. This is a very valuable message, but it was articulated in a rambling way that left me bored halfway through the book, and not even the Harry Potter framew This report was written for BCIT's Peak Leadership program. tl;dr : A few good points; a few things I seriously disagree with; despite the Harry Potter, I was bored. 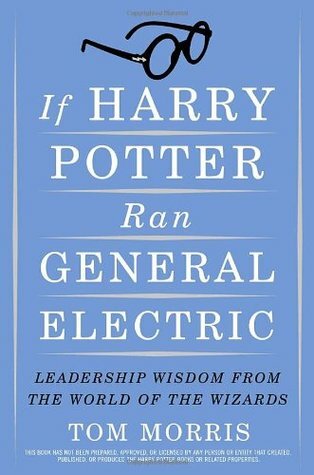 The central idea of If Harry Potter Ran General Electric: Leadership Wisdom from the World of the Wizards can be summed up as: To be a great leader, you must be an ethical person. This is a very valuable message, but it was articulated in a rambling way that left me bored halfway through the book, and not even the Harry Potter framework could relieve me from that. Tom Morris characterises an ethical person as virtuous and wise. By virtuous, he is referring to the Aristotelian virtues of courage, temperance, liberality, magnificence, pride, good temper, friendliness, truthfulness, wittiness, and justice. Thus, the Aristotelian virtuous person will commit to doing the right thing despite danger, strive to tell the truth, freely help others, behave well and moderately, and treat others sociably and fairly. They will be able to act with a sense of honour, a sense of humour, and on a grand scale (p.7). I do appreciate that at least one of these virtues is a prime characteristic of the each of Hogwarts houses – Slytherin is proud, Gryffindor is courageous, Hufflepuff is friendly, and Ravenclaw is witty. He does not take the easy option of shaming Slytherin as evil or Hufflepuff as useless. Anyone can be virtuous. Wisdom is the ability to apply these virtues to the situations in front of you. The most important lesson of the book was the reflection on the Golden Rule as a means of testing whether an action is a moral one. More precisely, the moral test from J.K. Rowling’s novels is “If you want to know what a man’s like, take a good look at how he treats his inferiors, not his equals.” (Harry Potter and the Goblet of Fire, p.456) However, this is hardly a unique insight. The Golden Rule “Do unto others as you would have them do unto you” is common to most cultures and religions, and treating receptionists and waiters with the utmost respect is oft-repeated interview advice. 1. Prepare for the challenge. 2. Surround yourself with support. 3. Engage in positive self-talk. 4. Focus on what’s at stake. These steps seem simple and obvious, but their precise articulation was illuminating. First, to assume a self-confident attitude, secure yourself in the knowledge that you have worked hard in the lead-up and have all the skills and resources you require to take on the task. Second, develop a supportive and encouraging group of friends and colleagues to provide moral and practical support when you need it most. Third, believe that you can do what you need to do, and replace your fear with that confidence – a form of “fake it ‘til you make it”. Fourth, remember what’s at stake – when it’s something that you value, you can set aside the negative emotions to protect, preserve, or create it. Finally, take action and do what needs to be done. It’s a simple blueprint for success, and it’s definitely the biggest lesson I have taken from this book. The main point where I disagree with Morris and find his arguments lacking is in his characterisation of Albus Dumbledore as a great leader. The first chapter extols the virtues of Dumbledore, but downplays the occasions when he does not display these virtues. Morris discusses Dumbledore’s truthfulness as one of the qualities that makes him a great leader (p.9), but Dumbledore is frequently economical with the truth. He does not tell Harry all he needs to know, such as the true nature of Tom Riddle’s diary, why he trusts Snape, anything about the Deathly Hallows, or why Voldemort is particularly obsessed with destroying Harry. Morris doesn’t truly address this huge and repeated mistake – one that costs lives – until 165 pages later. He instead dismisses it as “not everyone is equally well prepared to deal with every possible truth” (p.9), only to turn around and say it was a “serious mistake in how [Dumbledore] handle[d] the truth”. (p.175) Dumbledore obviously inspires loyalty and trust from Harry, Ron, Hermione, Professor McGonagall, and all those who oppose Voldemort, but if a leader is characterised by the people he associates with (and delegates authority to), as suggested elsewhere in this book, then I have serious concerns about his judgement. In addition to his friendship with notorious Dark wizard Gellert Grindewald in his youth, he took in incompetent Order members (Mundungus Fletcher, whose flight at the beginning of Harry Potter and the Deathly Hallows results in the death of Alastor Moody), hired a series of incompetent professors (Gilderoy Lockhart, Professor Binns, Sybil Trelawney) and pathological bullies (Severus Snape). This does not seem like the mark of a great man or a great leader. This book exists on at least two levels, and both of them are worthy of consideration for both readers and writers about the intersection of pop culture and philosophy with business theory. This book is an example of two different phenomena in our contemporary world of publishing: the ubiquity of books relating seemingly superficial pop culture with deep and searching philosophical examination  and the tendency of books on business to seek legitimacy from popular culture and history . These tendencies are not bad, they just radically shape the sort of works that are created by and about business culture that reach readers like myself (and presumably yourself, since you are read this as well). On the one hand, the book seeks to show the philosophical heft of the Harry Potter series and its relevance to management, something the author does skillfully, while on the other hand the author seeks to portray milquetoast GE CEO Jeffrey Immelt as a sort of wizard himself, which he is less successful at. Understanding that both goals--legitimizing Harry Potter by associating it with a real world notable business culture, and legitimizing the business culture of GE by associating it with the cultural cachet of Harry Potter--is essential to understanding this book and the fact that there are so many like it in our contemporary society. The contents of the book are straightforward and also striking, in that the author has shown himself to be a deep reader of the Harry Potter series, at least the first six books of that series that are included here, making this yet another book that was released before the series was done  that seeks to mine insight from the books as a whole and to put them on a cultural pedestal. The roughly 250 pages of this highly quotable  book are divided into seven chapters dealing with such subjects as Albus Dumbledore as an ideal CEO, the courage of Harry Potter, the ethics of wizards, truth and lies at Hogwarts, leadership alchemy, the wisdom of the wizards, and questions of happiness and meaning. Throughout the book as a whole the author does an admirable job of showing close reading of his material and avoiding spoilers for those who have not read the books as a whole but who might be open to gaining wisdom from them. Overall, the book offers a fine balance between contemporary humanistic management theory in the vein of Maslow and Vroom and others and a literary analysis of the Harry Potter books themselves, something that should satisfy a wide audience. There are at least a few worthy takeaways that a reader can gain from this book. One of them is the desire that many companies have of being seen as cool, and the way that business seek to gain legitimacy through the creative arts, whether in terms of film or music or literature. For another, this book is ample evidence of the nature of a philosophically inclined person to be able to think deeply based on nearly any material that comes to mind, and that for the philosopher, both business and popular culture are some of the few areas where philosophers can conduct their trade and maintain some sort of steady income, given the rarity of philosophy as an area of interest in the wider scope of American culture. It is rather telling, and relevant, that the author draws attention to the fact that the first novel in the Harry Potter series is known as Harry Potter and the Philosopher's Stone in Rowling's native Great Britain and most of the world, while in the United States the novel is known as Harry Potter and the Sorcerer's Stone because it was thought that Americans would be unfamiliar or uninterested in philosophy, something that seems to hurt the writer (and likely many readers in his intended audience) on a particularly personal level. This book makes for a fine example of why popular philosophy deserves a much better reputation among American readers. "Nervousness is a form of energy. It's up to us what we do with it. We can let it shut us down, or we can surf on it to success. The best people often feel quite nervous just prior to a performance or challenge. Those who rarely experience this electric emotion tend for the most part to be clueless slackers who really just don't care, and who therefore never accomplish very much. Nervousness is a sign of emotional commitment and existential, personal investment--a reflection of our values--and it can even be an indication of inner readiness (43-44)." In the true style of Tom Morris. If you read any of his other books you can see how Tom weaves into the corporate mindset the thinking of great philosphers. Una maravillosa mezcla de administración, filosofía y magia. Cualquier empresario con un mínimo interés en la filosofía y un mínimo de disfrute por el mundo de JK Rowling podrá sacarle provecho! Way too long, and dull. Why couldn't he have waited until all 7 books came out before writing this? It had some really good points to it, and I was able to make this my "book on leadership" that I had to read for a leadership program at work, but there are so many more lessons we can learn from the last 2 books in the series! Particularly the chapter on Dumbledore. We learn SO MUCH about him in book 7, and that would have really beefed up that chapter! It was good, though. Further confirmation that JK Rowling is a geni Why couldn't he have waited until all 7 books came out before writing this? It had some really good points to it, and I was able to make this my "book on leadership" that I had to read for a leadership program at work, but there are so many more lessons we can learn from the last 2 books in the series! Particularly the chapter on Dumbledore. We learn SO MUCH about him in book 7, and that would have really beefed up that chapter! This was an inspiring book. For those who study both personal development and enjoy Harry Potter stories; this will be a fulfilling experience. Tom Morris has done a great job at teaching success and leadership principles while using Harry Potter and Dumbledore as the examples. I would recommend this book to anyone. If you are a Harry Potter fan, you should definately read this book. It is all about leadership, and how to be a better leader, by bringing in examples from the Harry Potter books. It discusses the lessons we can learn from Harry and his friends. I loved it! Overall this was great, but can we please get a second edition that includes book 7? There is so much more to the Harry Potter series which could further Tom Morris' points even further. Intriguing book about business ethics. An interesting perspective on the Harry Potter books. Lots of leadership insights. I didn't really like the book. It was ok but not what I thought it was. I like this guy! A lot of what he says I personally already noticed reading Harry Potter myself, but at least there is someone else who thinks the same. An optional-read company profile for knowledge workers, managers, directors, C-levels, and entrepreneurs.